Fits perfect and I can see my sea shells through my glass top table. Finally found it online ! I have been looking for yrs for a clear elasticized vinyl tablecloth! This one is great! I can see the hardwood on my oblong table and know it's protected. There are wrinkles BUT putting a cloth down and hot food plates is getting out the wrinkles. I've read you can take a cloth and iron to get the wrinkles out but must be very careful! Love it and the price! Use it on my glass kitchen table. Love it! I absolutely LOVE these elactized table cloths, no one pulls the table cloth from the table when moving to and from the table and the clear one is great as you can still see the beautiful table underneath - I buy a new one every 6 months or so as over time you may get a small hole in them but my kitchen table is used 16 hours a day! Protects my antique table and shows the beautiful wood grain. This is the second one I have purchased. My cat gets on my new wooden kitchen table and this protects it without covering the beautiful wood. As much as I try to keep my cat off the table it gets on it when we are sleeping or away. Of course, after awhile it got little holes from the claws, it still lasted quite a long time. Very pleased with all your products. On my beautiful dinning room table. Good protection for wood tables. Easy to wipe off and keep clean. This product is used on a marble table that is used all the time. To protect the surface I was using place mats or table cloths, but it totally covered the beautiful surface. I really like this covering, although the "wrinkles" in it don't seem to all come out. I ordered the small for a 44" table and although putting it on is a two person job, it fits snug and as smooth as possible. The table is protect and the beauty can be seen! Love his cloth. Was able to uncover wood grain top dinning table. Put in dryer for seconds, watch closely and wrinkles come right out and you can smooth it over your table. I use these covers on my round glass kitchen table. They are see through. So I can see my wood floor. I needed protection for my new dining table from my curious cat's paw prints. This cover is a good thickness and since it's clear, I can still see the finish of the table. The elasticity provides a nice, snug fit. It's easily removed when company is expected. It's exactly what I was looking for. i have a beautiful butcher block table in my kitchen. this clear tablecover shows the butcher block and protects the table from stains especially the black ink from the newspaper. thank you i love it. 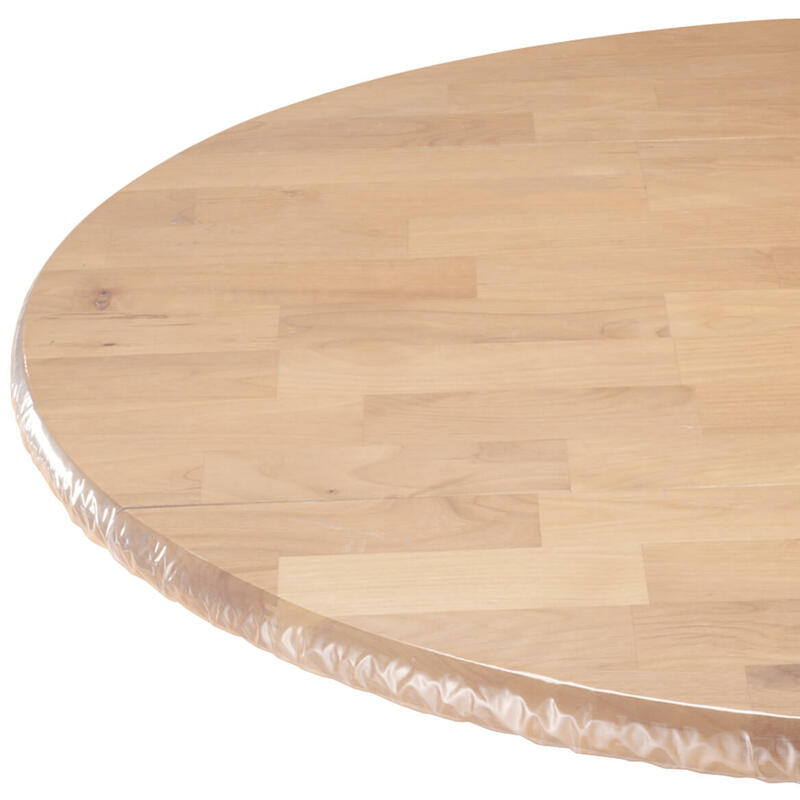 Great protection for my oak round table, saves my table from stains and marks. This is my second table cover. Use it to cover my oak table so I can use it as our kitchen table. Great to use over patterned table cover on patio. It lets the design of the patterned cover show through while, at the same time, protecting it from bird droppings, things falling off trees, etc. 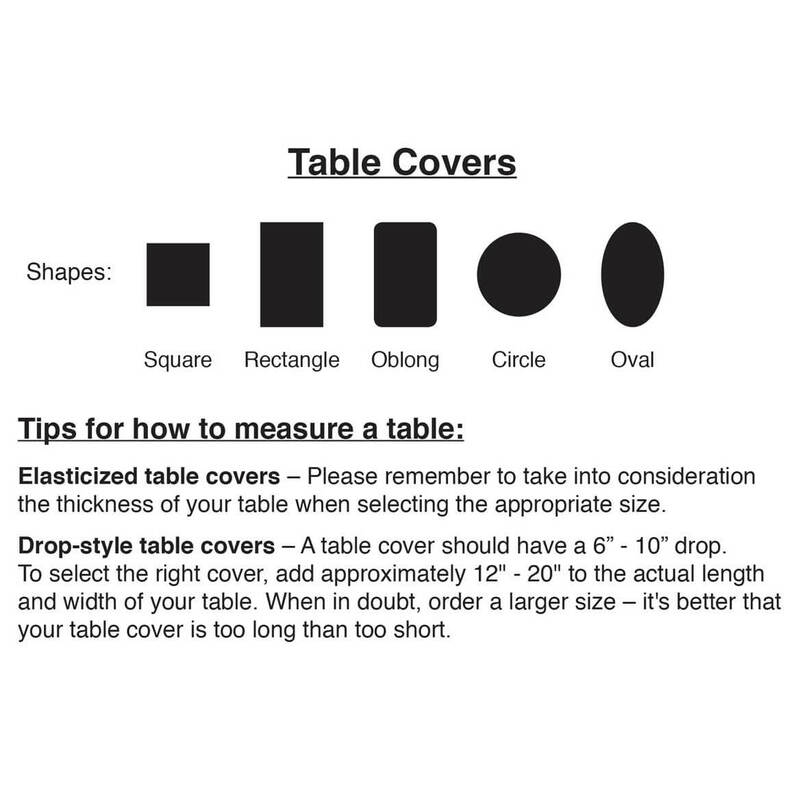 I use this type 0f table covers on all my round tables. Including the round wood picnic table. ABSOLUTELY... it's EXACTLY what I wanted. It is a fitted clear vinyl table cover for an awkward sized diningroom table. The comments read that the round size would adjust to fit perfectly and it does. Thank you so much and I will definitely be ordering another one in the near future. I have a beautiful wood table. Other table covers/tablecloths protect it, but mask its beauty. I was concerned that this plastic table cover would look like your grandmother's plastic furniture covering. It does not. I'm pleased with the product. This is the second one we have bought. Great buy for the price lasts for a good 4+ years then elastic gives out slowly. i would always buy this product. I just put my placemats under the clear table cover.it is easy to clean and I can still enjoy the wood look. It's much better and heavier! I think it's great. The quality is wonderful for the price. You can not find better. I use this to cover a black dinner table. It helps with the knics and scratches I was getting on the table. And it goes with any color and very easy to keep clean. Easy fix for the wrinkles! I use clear covers for tables in my middle school classroom that are used by over 100 students daily. Last year I ordered these from a company in Boca Raton, Florida, and they were thick and held up all year. On the insert in the package I received it said to put the table cover in your laundry dryer on low for A FEW SECONDS, then quickly cover your table. I have been looking everywhere for the Elastic Clear Table Covers and couldn't find them until I saw your website. I bought 2 since they are hard to find. I love it and regular table cover shows through and looks so nice and clean. Would advise anyone with children to buy it too. I use this table cover on a handmade Amish wood table. The clear cover lets the beautiful natural wood show through. Also protects the table from cat claw scratches. Finally a clear table cloth where I can both protect and show off the beautiful wood pattern. We use this on our kitchen table all the time, and it's GREAT! We're able to use any table cloth underneath we'd like, without the worry of the kids ruining them! (we have three - 2 1/2 yr old twin boys, and an 18 month old boy) I highly recommend this!! Now, I can have any tablecloth I want and just put this on top of it!!!!!! This was one of the best purchases I've made for our kitchen table!!!! Used to cover a round wooden table and protects the finish. Easy to use. This table cover allows the beauty of the wood to be seen and that is why we bought the table in the first place. It had to be covered because our cats scratched it. Now with the clear cover, we see the wood but don't have to worry that the surface of the table will be ruined. I was looking for this and finally found it. I have a nice crocheted table cloth but hated for it to get dirty so wanted a clear table cover with elastic so it would stay on the table and not slide off. This worked great. The clear cover is just what I was looking for to protect my new kitchenette table. I had a vinyl tablecloth on it originally, but didn't like that it hid the beauty of the wood grain. Will try suggestion of another reviewer about using a hair dryer to get out the wrinkles. So pleased with this purchase! Thank you, WD!!! this is a great product.I use decorative cloth underneath.I highly recommend it. This is s great table cloth.. I love this table cloth. It stays put, it's easy to clean. You can put it over another decorative cloth or over your original table to keep it protected. I love being able too see my table top and not worry about water rings or food damage. Love this product. love the clear fitted table cover. it saves my cloth table covers from stains(I PLACE THE CLOTH ONE UNDERNEATH). its a nice snug fit and doesn't slide around. the quality is great and not a flimsy plastic; its sturdy. infact i ordered 2 more for the future.i can't say a negative word about the cover. To help keep my tablecloth from getting dirty. Wipes up easy. Fits perfect on table. The only cons is its wrinkled when you first take it out if package but nothing a blow dryer couldn't fix. Plus over time the winkles works out being on table. Glad I finally found clear table covers to protect my inlaid wood table. I cover my kitchen table with a cloth and then my large doily that is dear to me from my sister. The cover protects them from spills and you can still see their beauty. It fits perfectly and hope when I need another, it will be available, but the catalog I received today does not have the clear one in it. The folds in the plastic will not smooth out is my only objection. Other than that it is perfect. Looks really nice now that the wrinkles have disapered! I have a beautiful new table that I didn't want to cover up. This was the answer! I love this product. You are the only company with clear covers. I have a beautiful round inlaid table and many cats. This cover offers decent protection from their nails but can also be slit if they get too rambunctious. It's the only cover that lets the wood show through and is cheap enough to replace twice a year. Will continue to buy to replace. It's nice. I was going to use it on my table but it was too big so it wouldn't flatten out. A bit lightweight for outdoor use, even on a covered porch. good job protecting the wood on my table, Great for when the grandkids are here! I got a couple of these.The clear one & a blue one with tiny dots on it. I use them together. I put the colored one on. Then, I put the clear one over it. Looks good. Keeps the colored one cleaner & protects my table too. Took a week to get wrinkles out, but it makes oak table look nice. It would be better if it was a heavier plastic, would make it more durable. i like it because it's clear & you can still admire the wood table. i did'nt like that it came very wrinkled, i had to take time to iron it. protects your table from scratches, nicks and kids doing homework,covers table very well, would purchase again.the only flaw is trying to get the wrinkles out. CANT LIVE WITH OUT IT!!!!! Was much thinner than what I was expecting and than other table cloths I have like these, but they work? My oak table was getting water spots on it. I first used Old English furniture color before putting cover on. The table has a nice pattern and shows thru this cover. It takes two to put it on. Wonder how long it will take to get the wrinkles out. Will still use placemats. I followed the advice of another reviewer and used a hair dryer to get rid of the wrinkles. It still has wrinkles, but they don't show too much. The wood grain of my beautiful oak table shows through, and that is what I wanted; not some cheap design. I like that you can see your table top and that it is protected. I like the durability of the product. I have had the current cover on my table over 1 year and my table is used every day, all day. I bought this to replace a worn out cover for a 40" round table in my sunroom. This new cover is clear. When I put it on I was disappointed to see very smooth areas and extremely wrinkled areas. This was not going to be acceptable. I decided to leave the cover on the table and heat it up with a hair dryer. The wrinkles quickly started disappearing as I smoothed them with my hand. I am now satisfied with the final look. I'm glad I bought it and would recommend it. I have a beautiful round wood table and I also have cats. So far, this cover has saved the table top from getting scratched. This is exactly why I bought this cover. How long it holds up is yet to be determined. I purchased this for a 46 inch round table. It is a bit too big and has a tendency to slide if we put too much friction on the table. It does not fit as well as the table cover we previously had from Solutions. Solutions does not make a clear version which was the reason I bought this one. I do like that I can see my beautiful marble table. I have used a hairdryer on the wrinkles for at least 20 minutes are they are nowhere close to gone but are improved. Perhaps time will take care of the rest. I like it because it fits my round table nicely and shows off the wood but I'm just wondering if the many wrinkles on the plastic will ever come off. This cloth sold as 40 to 44 inches but very tight on a table measuring 42 inches with a 1 inch edge. I did not account for drop. I bought this as a cover to keep the other round tablecloth I bought from Miles Kimball from getting beat up. However, this is wrinkled and doesn't seem to smooth all the way out. Underneath, I have a cloth-fuzzy-backed round tablecloth. That smoothed out. This also shriveled up where a soup plate had been put. Even putting a cloth underneath a dinner plate wasn't enough. It is now permanently distorted wherever a warm plate sat. Eventually, I will just take this off and use the underneath one. Have been using those for years until they get beat up. These won't last a month. Sorry. Won't be buying these again. If you are using them for a table that doesn't get used for hot/warm meals, or coffee, or tea, then it would probably work. It fits well, but looks a mess after the first use. I have a small oblong dining table and a 2 1/2 yr old. The table has a glass top and needless to say, always has prints and spilled stuff which gets under the glass to the wood underneath. I got this table cover to help with that. It is larger than I anticipated and the dimensions are really not accurate. It's really big but thankfully, I ordered the picnic table clips for something else and was able to use these to keep the table cover in place. I've been using this cover for a month, it fits fine now, but have to be very careful about slits. Water gets into slits and will stain tabletop. Have to raised cover and dry tabletop before spots develop. Trying to decide if I should order another one to replace this, or use two covers. Miles Kimball should have a heavier plastic so it doesn't tear. I've purchased 4 plastic table covers for our kitchen table from miles kimball. The first one lasted a year, was very sturdy and held up well against our three children. The second one I bought only lasted a few months before it began getting small holes in the plastic. These holes make it impossible to wipe down the table without moisture seeping down onto the wood of the table. I then bought two more which arrived a few weeks ago. Already, I have one small hole. I'm very frustrated to only get a couple weeks out of the table cover before getting holes. Sadly it seems the quality has gone down. I would not buy this product again! I've ordered previously and was satisfied. However these were so thin it won't take much to tear them. Very dissatisfied. In the future I'll b looking elsewhere. It took a week for the wrinkles to come out. It looks great on oak table. But, it could be a heavier plastic which would make it more durable. The description stated for oval or oblong tables. Not true . I accurately measured my table, and it didn't fit. Besides that it's impossible to get back in the package to return once opened. It was too big for my 45X63 oval table. It looked terrible because it was loose and wrinkly. Would not recommend this. It's big for our table and firm. Very winkle did everything I could to get wrinkels out and they will not come out. Waited a long time for delivery & then it had a slice right down the middle. Unable to use. Was told a credit would be given. I bought this hoping it would protect my table from my children. Right away it had a small hole, which my little boy quickly ripped open. I was expecting this piece to be heavier, more durable material, sadly, this is not the case. It fits fine on my table, though. I have been purchasing this same product from Miles Kimball for the last 10 years and the quality is no longer there. This table cover is much thinner and more flimsy than the other ones purchased over the years. Quality is terrible and also no longer wants to stay on the table. Despite the elasticized bottom, it bunches up and wants to come off of the table. This product is supposed to fit smoothly over a table top but is so full of wrinkles that will never com out that the product cannot be used. The only reason I'm not sending it back is because I will have to pay for the return shipping which is very wrong being the product is faulty and can't be used. This product was torn when received and I will be returning for credit. Came so wrinkled it looked awful! Tried everything to get wrinkles out and still looks terrible. Don't buy!! Way too big and baggy! The size I ordered is not the size that arrived. It was so baggy and ugly that I threw it away. I bought this for my kitchen table, hoping it would be protected from my children. It fit well enough, but it got a hole in it right away. It is very thin, I was expecting it to be a heavier, more durable plastic. I'm going to try the fitted table cloths that Miles Kimball offers, they sound like they will be more durable. This table cover is awful. Came wrinkled and have tried heat, blow dryer, and still terrible. If shipping was free I would send back so fast. Shipping should be free to return as this is a defect and impossible to remove wrinkles. DONT BUY? I purchased this cover in 2016 for our round table and worked great to protect the table from our kids’ craft projects. Just purchased another one for our oblong/rectangular table for the same reason. Needed for my granddaughter's coloring table. SAVES MY OAK TABLE, HAVE USED FOR A LONG TIME AND THEY CAN GO OVER A PRETTY HOLIDAY TABLECL0TH OR JUST ON THE TABLE. I have order this before. I do arts and crafts with my granddaughter on my patio table. Im getting this to protect it. Refinished table top and husband is messy! You can have a beautiful table cloth on the table without stains forever using this on top!! Wife wanted a change and this shows our table. I have purchased fitted table cloths from Walter Drake previously and have always been pleased with them, so it was time for a new one. NEEDED ONE. COULDN'T FIND IT AT ANY OTHER DEPARTMENT STORE. I hoping it will fix my table. protects my wood table from everything. Have ordered many round vinyl table cloths from WD and liked all of them. They stand up to everyday use very well. A table cover that doesn't slip and slide is perfect for my table. Will use this on my parent's table to keep tablecloths spot free. I love this table cover because of the Elastic around them .They don`t fall off the table. Because My kitchen table top is mosaic tile and to keep the grout clean - I have to protect and keep grout clean - other table covers hide this beautiful tile. With the clear table cover - it is still displayed - yet keeps the table top and grout sparkling clean! To protect my new table that has a glass top insert. I hope it fits. To protect my table! I love the look! I like the clear Table Cover it let's my table show which is oak. I can still show off my table while protecting at the same time. I chose the clear instead of the design cover this time because, I got new kitchen cabinets and my table matches them perfectly. I got all my plastic table covers here and they fit just right. They have a good variety. Thank you 🙏 Walter Drake. the clear is really nice and makes clean up much easier. I think I got it several years ago and really liked it. Have purchased before; Walter Drake has what I need in the right sizes. been looking for this item for a long time....got it now! Been using it forever. Only thing that will save my table from my young kids! Will the oval fit on a retangle table? BEST ANSWER: Thank you for your question. No. this will not fit a rectangle table. We hope this information will be of help to you. How thick is the cover? I purchased one from another catalog & it was so thin that when I put a bowl of hot soup on it, it crinkled. BEST ANSWER: To me it's thick enough. I do find that if you do put some sort of hot bowl on it that it might "crinkle" as you say, but keep in mind it is plastic so that may happen. I have mine over a table cloth to protect the table cloth from stains. I don't think you will find a thicker one than this anywhere else. It's pretty much a standard thickness. It's my second one. Had to get a new one because there were some knife cuts in the old one. They say you can use a hair dryer (not to close to the tablecloth or you will burn it) to get the wrinkles out or put a damp towel over the wrinkled area and then iron the towel. I love my clear tablecloth! So do all my guests. I do use placemats when serving hot soup and etc. but the clear tablecloth lets the beauty of my oak table show while protecting it from scratches and spills. I have had it on the table now for several months and it still looks good There are no tears or holes like with some thinner tablecloths. You will like it! I haven't ever put it in hot water, but is is pretty thin. Did not hold up very well. Has some very small holes in it and I cannot use it on my walnut table. Thank you for your question. The thickness of the Clear Elasticized Table Cover is 4 gauge. We hope this is of help to you. This is one of the best plastic covers I ever bought. We put hot plates on it all the time and have had no problem with it. 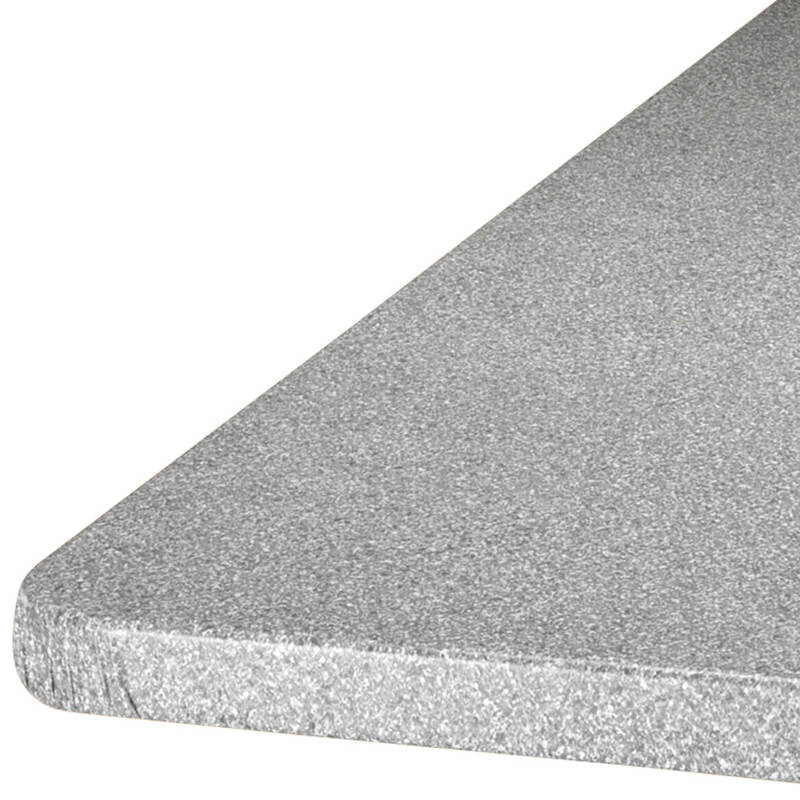 Will the small size clear elasticized work on a 39 inch round table with a 1/4 inch edge? BEST ANSWER: Thank you for your question. The 40-44" dia will work for a 39", there will just be more material under the table. We hope this information will be of help to you. will the 42X68 oval fit snuggly on a 44x55 table? BEST ANSWER: Thank you for your question. The 42x68 will not fit properly as it will be to small for a 44 width. We hope this information will be of help to you. what is the best method to use to reduce wrinkling? BEST ANSWER: Thank you for your question. Please put the table cover in the dryer on a low setting for a few minutes. tWe hope this information will be of help to you. I find that after several days, the wrinkles disappear! I put mine in the dryer on delicate for 2 minutes. Is this safe to put on a table with bird toys so my pet bird can play without risk of danger? BEST ANSWER: I've been using the clear round table cover for about 10 years . I love it because its thick, sturdy and washable . I usually buy 1 per year . And I buy it from Walter Drake . If the tablecloth is tut, I don't see a problem. 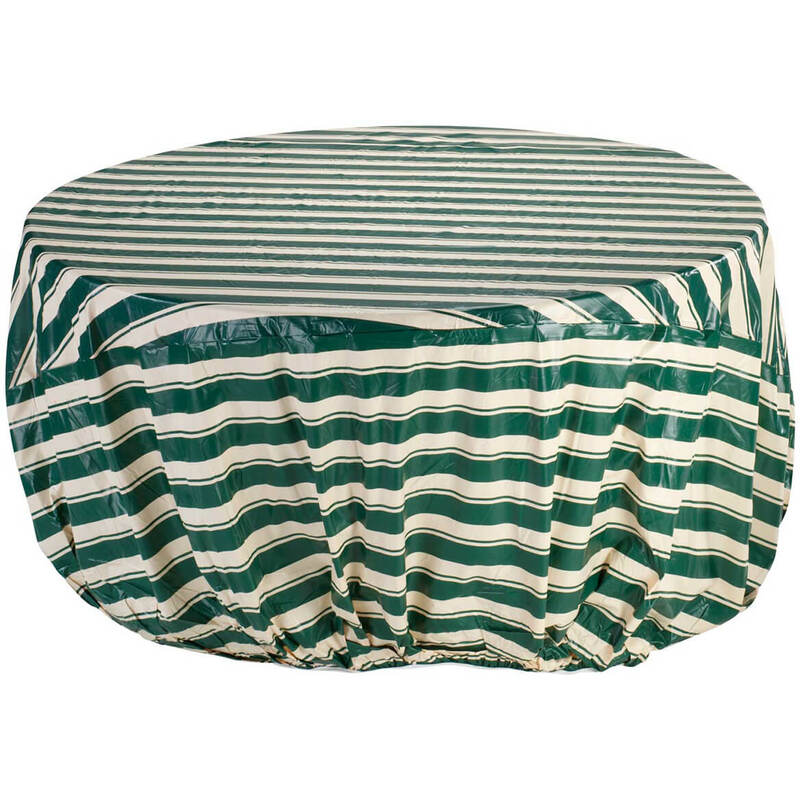 I'm looking for a clear elasticized table cover oval 42"x76. Do you know where I can get one that size? BEST ANSWER: I bought this table cover back in Dec. 2015. We are still using it, it looks good and works great! We can see our pretty oak table but don't have to worry about it getting ruined from water stains. Thank you for your question. Unfortunately we do not carry any 42"x76" table covers. We hope this information will be of help to you. Do you have a square clear table cover? BEST ANSWER: Thank you for your question. We do not have one for a square. We apologize for any inconvenience. Do you have clear rectangular protectors that are elastic fitted? BEST ANSWER: Thank you for your question. We do not have any covers at this time to fit a rectangle. We hope this information will be of help to you. I have a 42x70 oval table. What size cover will fit? BEST ANSWER: Thank you for your question. These are too small for your table, we apologize. We hope this information will be of help to you. 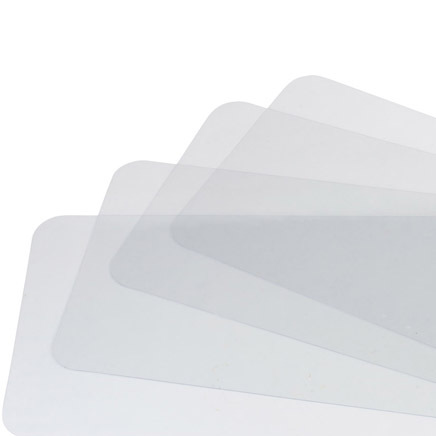 Do you have rectangle clear plastic table covers? BEST ANSWER: Thank you for your question. No, there is not a clear rectangular cover. We hope this information will be of help to you. 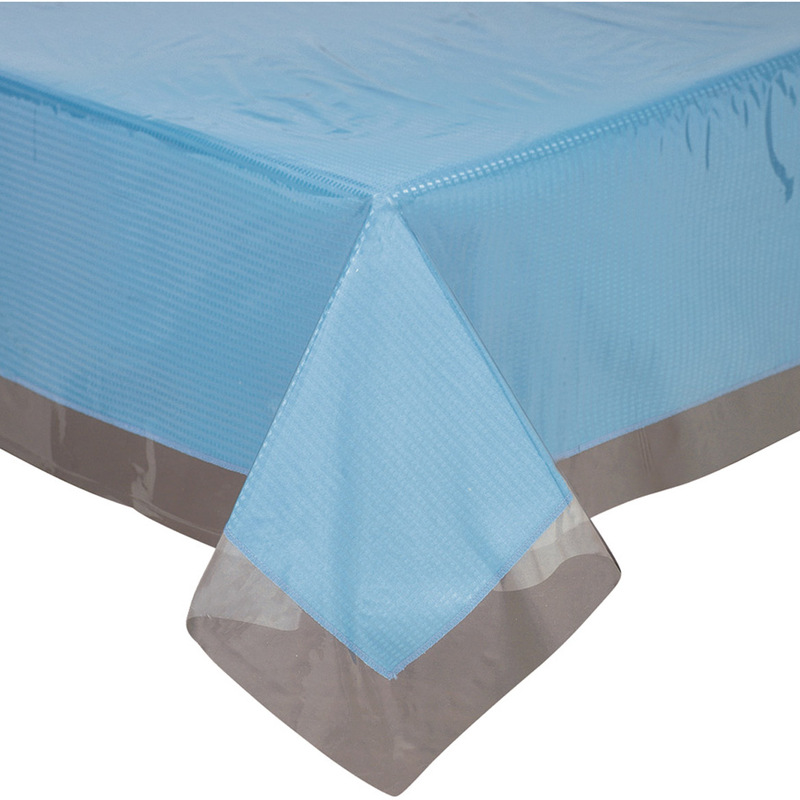 Do you have any Clear Elastic covers for Octagon Tables 8' in size? BEST ANSWER: Thank you for your question. Unfortunately we not carry any table covers that will fit a 8' table. We hope this information will be of help to you. Do you have 80" dia. clear plastic cover for round Table? BEST ANSWER: Thank you for your question. Unfortunately we do not carry any 80" table covers. We hope this information will be of help to you. i have a 48" round. can I get that size? BEST ANSWER: Thank you for your question. 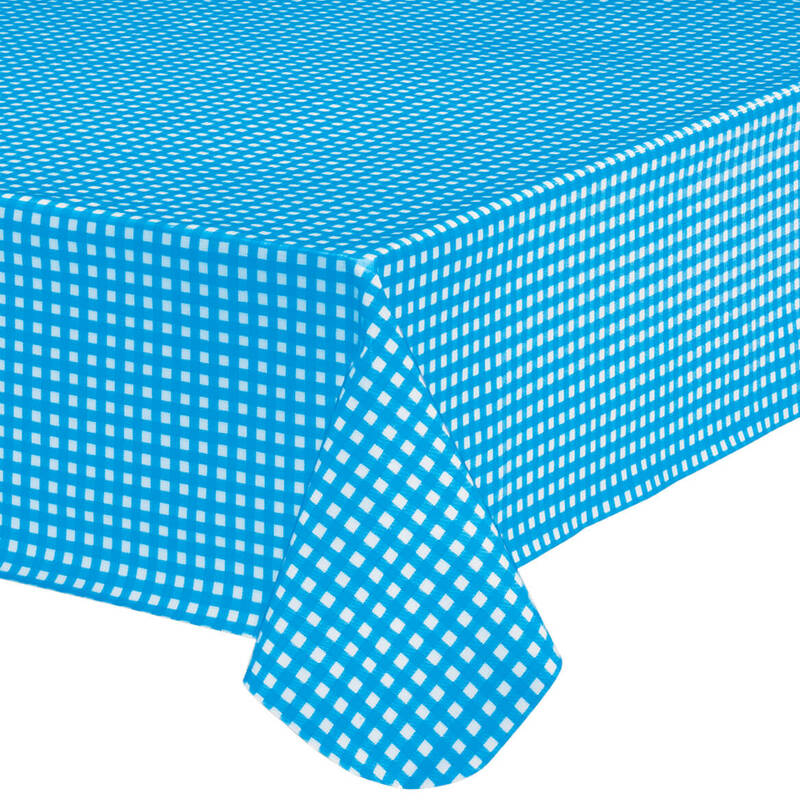 The 45" to 56" table cover will fit your table. We hope this information will be of help to you. 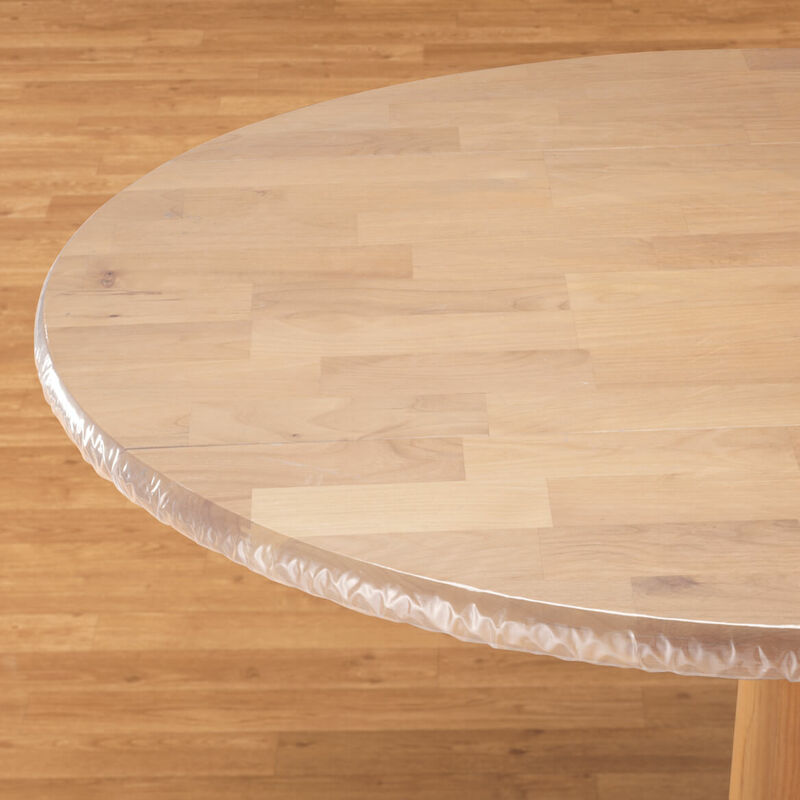 How well this product fit on my 42X60 oval dining table? BEST ANSWER: Thank you for your question. It might be a bit large the long way. The sizing listed is the size of the table it fits, not the size of the table cover. We hope this information will be of help to you. THANK YOU FOR YOUR QUICK ANSWER. FOLLOW-UP QUESTION. DO YOU HAVE A CLEAR TABLE COVER THAT WILL FIT MY OVAL TABLE 42 X 60? OR CAN YOU RECOMMEND WHERE I SHOULD LOOK? THANK YOU FOR YOUR HELP. I was trying to order the clear 40"-44" however it did not give the the size option, why? BEST ANSWER: Thank you for your question. Unfortunately, this item has sold out in the 40-44 inch size. This item is canceled and will not be coming back into stock. We apologize for this inconvenience. Is the large round cover not avaialble? BEST ANSWER: Thank you for your question. Unfortunately, this item has sold out, we are not getting anymore stock. We hope this information will be of help to you. Hi I have a 60" round. Do you have any clear elastic that will fit it? BEST ANSWER: Thank you for your question. Unfortunately we do not have a table cover that big. We hope this information will be of help to you. I need oval 56" - 68"? I have many round ones but now I need one for the leaf. I want a clear table cover for for an oval table 56" by 68" for bigger as then more would just go under the table.